[New for 2014] Hello! we interrupt the final post of Nick week to let you know that Dairy Queen has gone and given us an early fall surprise this weekend. Remember how I always say that the new Grill 'n Chill is awesome about being on time with new blizzards? Well, we were going to wrap up our family Saturday stuff with the Chips Ahoy blizzard when my wife goes "APPLE PIE BLIZZARD!". Wait, WHAT?? Sure enough, I look over and in the window is the new Apple Pie Blizzard and get this, the excellent Pumpkin Pie blizzard is back already!! I'm usually the first to complain about fall flavors coming in to early but I'm so stoked right now. Do I try Chips Ahoy again or do I go Apple pie? Oh man, what to pick?? Apparently the "Big Apple Blizzard" went over well in NYC because this one seems to be along the same lines. It's vanilla soft serve, apple chunks, pie crust pieces, and a healthy sprinkling of cinnamon (and sugar?) on top. Don't let the plain looks fool you. Ok, does everyone remember what I love about strawberry blizzards? 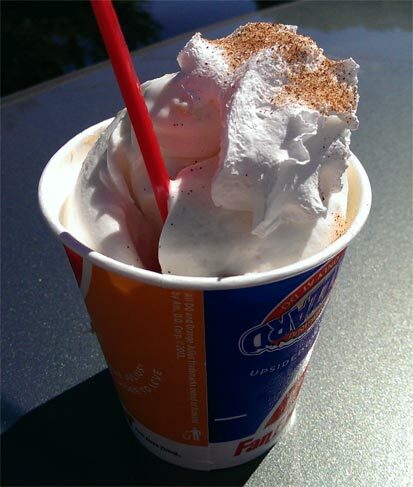 or even the pumpkin pie blizzard? It's that strong, fresh, fruity taste! That "wow I can't believe I have this taste in my blizzard" type moment. Yeah, that's what we have here. My wife was instantly in love with this one and I know why. They've taken that sweet, sweet excellence of a ice cold apple pie and shoved it in to this blizzard. There is just a ton of flavor and it all feels perfectly natural. [If you've ever had the cinnamon apples from Boston Market, then there's a good chance you'll be thinking about them the whole time you eat this blizzard]. This blizzard has skipped the traditional sugary graham crust for what I can only call cinnamon toast crunch's little brother. They are thin, crunchy, and I wouldn't have minded a few more of them [but then again, I'm addicted to crunching]. 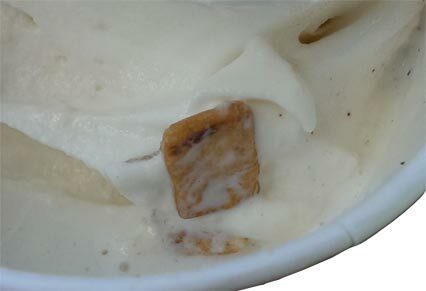 You also get some very small apple chunks in your blizzard. They are too small to be icy or annoying, instead they just kind of keep things fun and interesting. To be honest, I was eating so fast that I almost missed them, but my wife got a ton of them and made sure I stopped long enough to notice them. So there you have my first inhaling sampling of the new Apple Pie blizzard. It's one of those blizzards where the more you think about it, the more you want to go back tomorrow for another one.... must resist.... must resist. On Second Scoop: So DQ sent me a gift card (and some cool gifts) so I would weigh in on their 2014 Blizzard Battle. 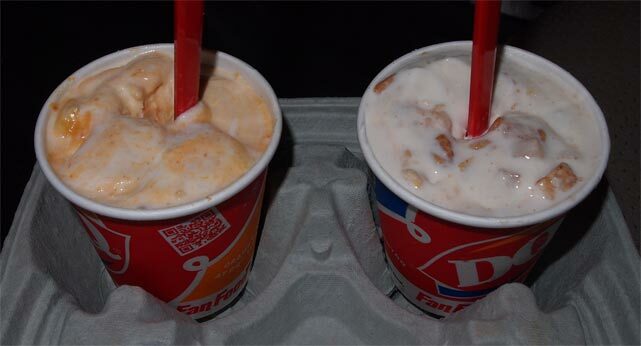 I thought it would be pretty close, but I had kind of forgotton how awesome the pumpkin blizzard is. The apple flavor is nice, but the pumpkin is perfect. The apple graham bits are fine, but the pumpkin pie pieces are superb. You're neat apple, but I gotta say, #VotePumpkin! I just had one of these! It's pretty okay! It's a busy Blizzard, I'll give it points for that. I think some caramel syrup would've really set it off. I don't get Blizzards nearly as often as I did in my youth (a Small's smaller than I remember); maybe it's just that I would've been more impressed in the innocent days before you introduced me to Talenti. This would have sounded pretty good before I found the local frozen custard place that does an apple pie "blizzard" the right way. They call it a "concrete", but same basic idea. 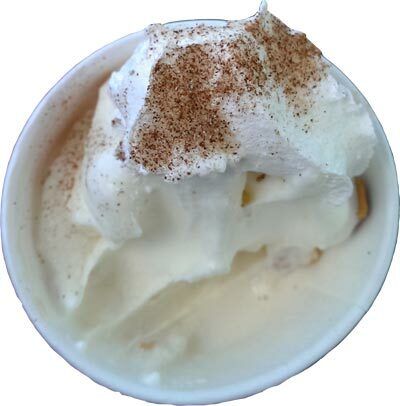 They take frozen custard (creamier than ice cream, especially soft serve) and it's blended with apple pie and caramel. I'm not certain, but I think the apple pie they use is one of those fried apple pies made by Hostess, TastyKake and other companies. They use at least half of a fried pie, maybe more, with rich thick caramel. It's delicious. @Anon: that sounds awesome! reminds me of New Orleans ICC's Hubig's Apple Pie flavor. Not sure how they managed to get the flavor of burnt Apple pie down but that's all it tasted like. Lots of burnt pieces of tasteless "crust" and where was the Apple??? Disappointed is an understatement.